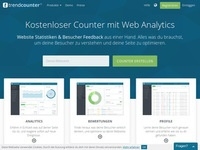 The trendcounter web analytics service has been on the market for more than 10 years and has collected statistics on more than 500,000 websites. This makes trendcounter one of the oldest and largest statistics providers. Free test now! Compensation for a lead occurs when the user completes their free registration via email verification and has integrated the HTML code to count statistics on their website. When applying by newsletter or e-mail marketing this may only be done in accordance with German jurisdiction (double opt-in, imprint, unsubscribe link, etc). If you are interested in SEM, please contact us in advance. Brand Bidding is strictly prohibited.